The Extia 1000 is designed to extend filtration lifetime by more than 40%. Ahlstrom-Munksjö has announced the launch of the Ahlstrom-Munksjö Extia 1000, a durable filtration media for air pollution control applications. The Extia 1000 is designed to extend filtration lifetime by more than 40% and is the first product on the Extia platform, a range intended for industrial filtration applications. The company says that from this platform, a family of products will be built over time, all of which will combine strength, high levels of convertibility and filtration performance. The Extia 1000 design also allows it to deliver effective removal of coarse particles at more than three times lower level of pressure drop. In addition, it is easier to convert into a filter on both knife and rotary pleating machines. 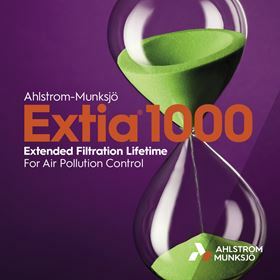 Fulvio Capussotti, executive vice president of Ahlstrom-Munksjö's Filtration and Performance business area, said that the Extia 1000 is a good example of how Ahlstrom-Munksjö can make use of its experience in manufacturing high performance filtration products to deliver new solutions for industrial filtration applications. The Filtration and Performance business area develops and produces filtration materials for transportation as well as industrial applications. It also makes nonwoven materials for automotive, construction, textile and hygiene applications.